I asked a friend today what the minimum age was for children to come along to her climbing wall. This is what passes for a light warm-up for my son, right before he launches himself into something a bit challenging, like a 50ft tree. He climbs his bookcase like it was a ladder AND STANDS ON TOP. He climbed up a 5ft wooden ladder at toddler group on Tuesday and I only knew about it because I heard him whinging that he couldn't work out how to get back down in the 5 SECONDS I had been away hanging his coat up. 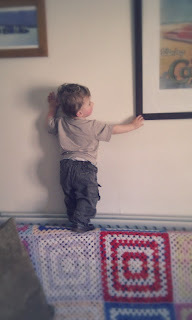 He climbs everything he can find ... INCLUDING HIS PARENTS!! He is unstoppable and like his mother before him, has absolutely no shred of fear. He’s a force of nature and a whirling dervish without so much as a screw to come loose. He still is a natural climber. He can shimmy up a climbing wall like a mountain goat!